St. Joseph’s Prep’s James Cherry celebrates a score en route to a come from behind victory over Coatesville, Friday, in the state 6A football semi final. DOWNINGTOWN — Coatesville was one of the last two teams from Chester County remaining alive in the state football playoffs — and unlike their downcounty neighbors from Unionville (which lost to Archbishop Wood in a one-sided 5A semifinal), the Red Raiders looked a like a good bet to punch their ticket to a second trip to the state final in Hershey for much of the game. 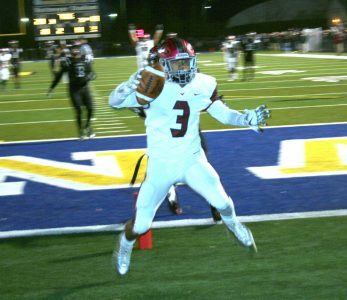 But the furious comeback by St. Joseph’s Prep — arguably the top football program in eastern PA — ended those dreams, as Coatesville fell 53-49 in the state 6A semifinal, Friday night at Kottmeyer Stadium. The 13-2 Red Raiders — champions of the Ches Mont National Division and District One 6A champions — looked firmly in control of the game well into the second half — before things unwound in the final quarter with Coatesville’s own comeback falling short. Throughout first half of the game, Coatesville beat St. Joe’s all over the field and only a few minutes into the third quarter the Red Raiders were ahead of The Prep 28-10. Aaron Young and Ricky Ortega connected on a few good plays including a 30 yard touchdown that put Coatesville up even more in the beginning of the third quarter. However, even with the great play from Ortega and the rest of the Red Raiders, St. Joe’s quarterback Marquez McCray was not going to go quietly into that dark night. Along with his fellow players James Cherry and Marques Mason, McCray led St. Joe’s to a massive comeback victory. After an interception thrown by Ortega that was nearly brought back for a touchdown, McCray put his foot on the gas and did not let off. With combined touchdown from McCray, Brandon Sanders, and James Cherry, The Prep began to run away with the lead. In the fourth quarter, St. Joe’s Prep lead Coatesville 35-25 and continued to score 28 more points to put them at 53. Coatesville was able to score two more touchdowns later in the fourth quarter but it was not enough to put them in front of St. Joe’s Prep. In victory formation, St. Joe’s ended the game with another win added to their 27 win streak maintaining this seasons perfect record of 13-0. The Coatesville Red Raiders finished their season 13-2 and have been eliminated from the playoffs until next season. St. Joe’s Prep will play in the 6A Final Game in Hershey against Pine Richland.